I first vaguely heard the name Nipun Mehta when I used to receive an email called ‘Daily Good’ in my inbox. 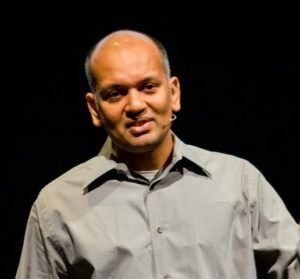 I had subscribed to the email about 10 years ago, and was always impressed by the quality of the content.A couple of years ago, I spotted that Nipun was speaking at a conference in Stockholm called ‘Wisdom’. I wasn’t able to make it, but decided to watch one of his TED talks…. Wow! I LOVED Nipun’s message. The stories he shared and the values he stood for warmed my heart. He got me hooked! Nipun Mehta is a man who’s never in his adult life, applied for a job. A man who hasn't worked for pay in over a decade. A man whose self-stated mission is simply "to bring smiles to the world and stillness to my heart". Through some synchronicity, I was kindly invited to have dinner with Nipun and other very inspiring individuals. Nipun’s kindness and warmth shone through. He naturally lives and breathes what he teaches. He even gave me a small gift at the end of the evening. It should have been me giving him a gift! He said to me: Join Laddership Circle. So (eventually!) I did. (Yes Laddership, not Leadership. In a nutshell, I’d say it’s about using inner transformation as a way of transforming organisations, learning from Service Space and other organisations that do so). Laddership Circle was a 6 week, live online group training with a small group of about 12 ‘changemakers’ from around the world, with Nipun oftening making time to join the video calls. Through spending time with such inspiring people, listening to uplifting stories and watching amazing videos, I found myself feeling more inspired and generous. And I’m pleased to say, the spirit has stayed with me ever since. The training made me a happier and kinder person, and importantly, enabled me to share more with others. The most heart-warming moment in the program was when Nipun and Audrey, a key volunteer for the program (the whole program and everything Service Space do is 100% volunteer based), decided to have a full 90 minute call, inviting all Laddership graduates, to explore, brainstorm and offer advice for ways for the Museum of Happiness to grow along the principles of generosity and giftivism. 12 wise, kind and smart people giving their precious 90 minutes just to support my organisation - expecting nothing in return. That was so inspiring! I’m proud to say, the Museum of Happiness is growing organically, following the principles I discovered over the last year. All our events have been 100% volunteer led and tickets have been either a free gift or a small donation. The volunteers have been incredible. This is very much an experiment and we don’t know how long we will be sustainable for - but I think whenever an organisation is rooted in love, it’s more powerful than anything else. As we have rent to pay and other expenses, I’ve been organising the Happier World Conference, together with Chi Phan, so that we can give a gift back to the Museum of Happiness, as well as other similar organisations in the future. The incredible thing is, Nipun will actually be speaking at our next conference in London! The power of courage and community. Nipun introduced us to his friend Pancho who runs a meditation circle in Oakland, California. He started Casa de Paz (House of Peace) is one of the houses that’s part of Canticle Farm, that provides a platform for a shift from an industrial-growth society to a life-sustaining society -- one heart, one home, and one block at a time.Every Friday, the residents of Casa de Paz -- whose main door is unlocked 24hrs, all days of the week -- hosts "Wednesdays on Fridays", an open-house meditation night that was inspired by a family in Santa Clara that has been doing this for more than 15 years. 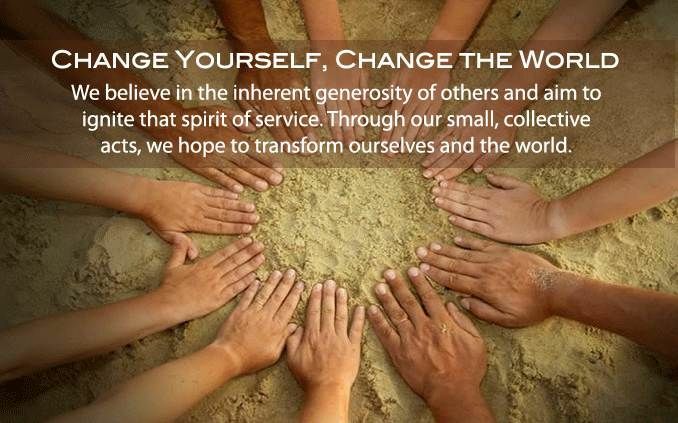 Sharing inspiring stories from the heart, changes lives.Karmatube’s video of a ‘generous talking cash machine’ actually brought me to tears (sorry, I can’t find the specific link), but there’s many others there to open your heart and mind. The site is filled with heart-warming real stories to restore your faith in humanity. The stories motivated me to be more kind and generous. In addition to the Laddership program, I’ve attended a few Awakin Circles in London with the lovely Trishna and Ani (which I highly recommend). And earlier this year, I had the honor to attend an Awakin Circle at Nipun’s home in Santa Clara, California. I arrived a few minutes late with my friends, and the door was open. We sat in silence for an hour in their living room, everyone shared a thought and then we were all given a delicious home cooked meal by his parents which we enjoyed in silence. Free! A gift with no hidden agenda. And this ritual has been happening pretty much every Wednesday for 15 years. That was so touching. After dinner we enjoyed conversations and were invited to engage in small acts of kindness. I’d urge you to take some time to check out Nipun’s videos and articles, and you’re welcome to share your thoughts with us in the comments section below. Meet and hear Nipun in person, with other inspiring speakers and workshop leaders at our Happier World Conference in London on 5th November. Save 50% if you book today! All profits from event donated to the Museum of Happiness.